Headlamps are powered up at the test station and the lamps are powered up in sequence and sensors detect that the lamps are lit. After lamp testing, the headlight is then subjected to an aiming process by using a servo driver to turn the adjuster. The amount of adjustment is based on detecting the headlamp illumination bands by a vision camera. Transfer cases arrive at the station on pallets and are manually pushed into the tester to position the transfer case against a servo drive system. Accelerometers and current analysis meters will detect current and vibration during the various test sequences. A second tester will complete the clutch burn in procedure and requires engagement to the transfer case drives. Based on the test results, all data is stored on a PC and is tracked against the distinct barcode on each assembly. 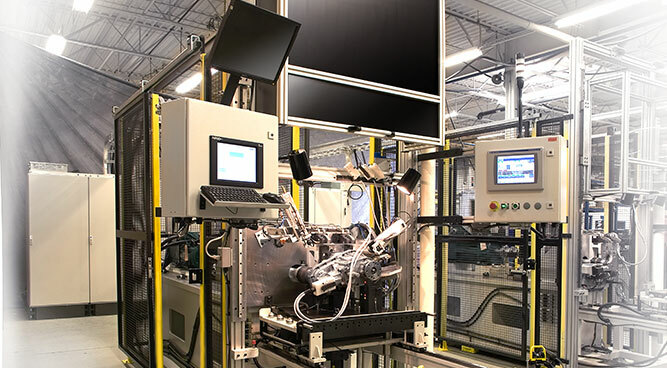 Electromechanical actuator is loaded in a fixture and automatically powered up. 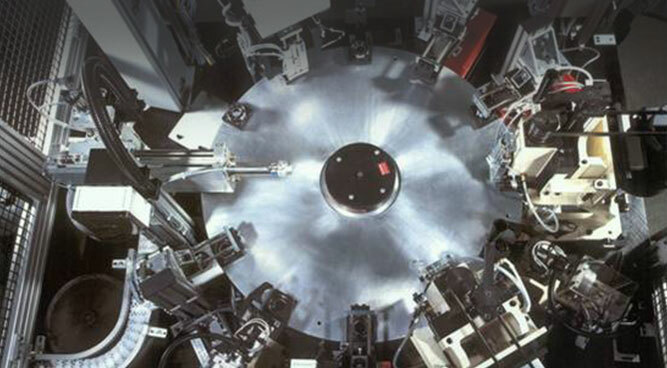 A computer controlled test program runs the actuator through a series of tests. Various external stop positions are introduced during the test sequence and the actuator torque and response time is monitored. Running boards are loaded into fixture tooling within the test cell. The fixture can accommodate 3 different part lengths. A load cell is mounted to the robot to contact the running board during deployment tests and will detect the effort exerted by the gearbox and deflection as the robot follows the travel path of the running board. 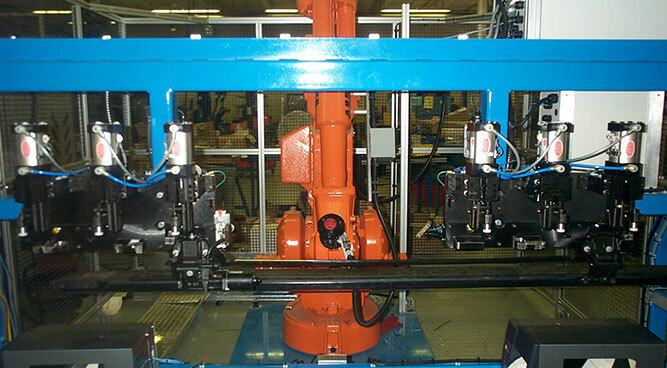 The robot and load cell arrangement maintains the contact angle on the running board at various orientations as well as positioning changes required for different running board lengths and styles. Partially assembled bearings are automatically fed onto the dial table. 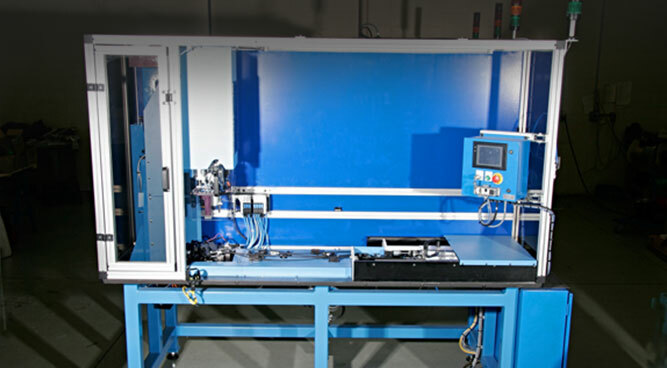 Stations on the table perform vibration and noise testing as well as detecting the dimensional clearance between the inner and outer profiles. After assembly completion, the gearbox is loaded to the test fixture. The gearbox is coupled to an electric motor and spun at various RPMs. 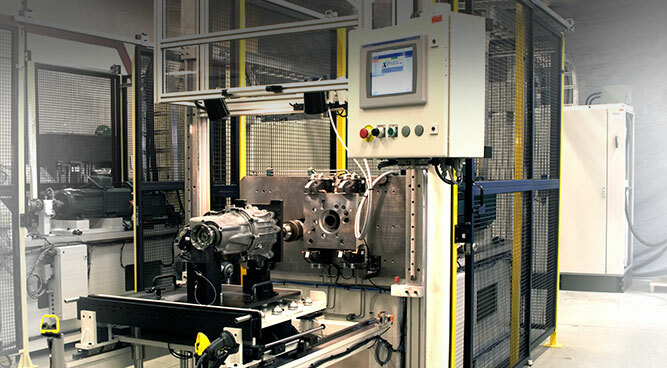 An accelerometer, in contact with the gearbox, will detect the noise generated during the test and determines if the gearbox has an acceptable reading. All captured data is stored in a PC against the serial number of the gearbox.